Our annual conference will take place November 18-19, 2019 in Seattle, Washington at the Westin Seattle. Our annual conference is the largest convening of grantmakers in the Northwest! We believe philanthropy is at its best when it is collaborative, transparent and equitable. Our conference provides space to convene together to learn from peers how philanthropy can build capacity in the social sector, commit to racial equity and DEI, and advocate for issues and organizations. Our 2018 conference was the best yet, highlighting the power of philanthropy and community in Boise, Idaho. We're excited to welcome our network to our backyard of Seattle. Early bird registration will open in April 2019. Please contact Anjana Pandey if you are interested in sponsorship opportunities. 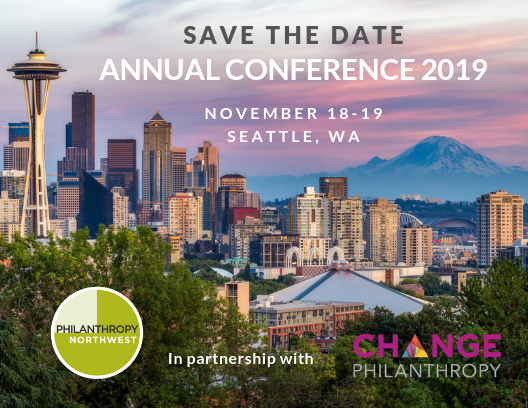 Philanthropy Northwest is proud to partner with CHANGE Philanthropy for our annual conference. Philanthropy Northwest members will receive a discount on the UNITY Summit if they choose to register for both events. Sign up here to receive updates on PNW19 and to be notified when our early bird registration opens. Questions? Contact Elyse Gordon for more information.